LabVIEW – the most common graphical programming language for measurement applications – is excellently supported by the Spectrum cards with the use of dedicated LabVIEW drivers. These drivers are based on the proven standard drivers of Spectrum. They combine different functions into functional blocks and make them available within LabVIEW. The drivers delivered include the basic LabVIEW diagrams allowing the user to change them to match his special needs and to understand how the programming of the hardware works. The LabVIEW driver package consists of several different dynamic libraries (LLBs) and some example VIs showing the use of the driver. 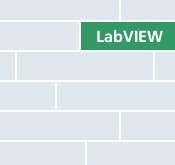 The LabVIEW driver supports all versions starting with version LabVIEW 2009 up to the current version. Both 32 Bit and 64 Bit Versions of LabVIEW are supported and have been tested. All new product releases are installed on our test systems and all examples are checked against the new version immediately. LabVIEW for Linux is not supported. The libraries consist of dedicated VIs grouping card functions for easy access. Besides this, a powerful library is included implementing time consuming functions like data sorting or recalculation of digital values to analog voltage levels for fast applications. Using these speed-optimized functions it is possible to reach the same data throughput between card and memory that can also be reached by plain C++ programming.